ID Tech EasyMag - Tracks 1, 2, & 3, Keyboard wedge interface. Includes PS/2 Y-cable. Color: white. The EasyMag reads up to three tracks of information with a single swipe in either direction. 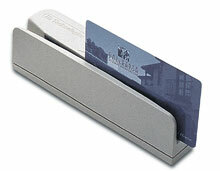 The ID Tech EasyMag is an intelligent magnetic stripe reader with a fully integrated USB interface (No adapter!). Designed for busy retail environments where speed and dependability are equally important, its standard length slot (more than 5 inches) makes it easy for anyone to swipe a card and get a good read on the very first try. It can also be programmed to rearrange, edit, and validate fields of entered data just like any other ID Tech reader. The ID Tech WCR3331-33Q is also known as IDTech	IDT-WCR3331-33Q	or WCR333133Q	.